Author of FINDING BLUEFIELD, a novel. 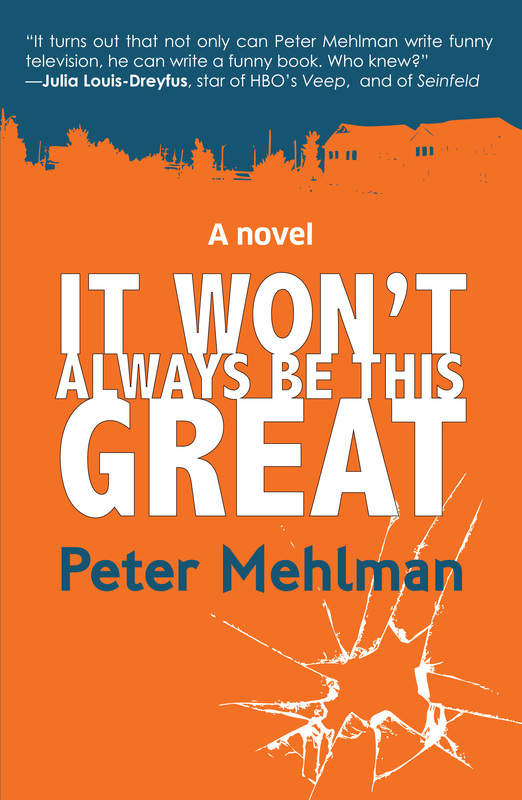 I met Peter Mehlman, known for his work as a writer and executive producer of the Seinfeld show, at a Santa Monica coffee shop to talk about writing, being funny, and his debut novel, It Won't Always Be This Great (September 2014, Bancroft Press). Mehlman, who fed the Seinfeld cast such lines as "Yada Yada" "spongeworthy," "shrinkage," and "double-dipping," said he was "still feeling a good endorphin rush" from his basketball game the night before. Set in the crushing complacency of suburbia, It Won't Always Be This Great is narrated by an unnamed Long Island podiatrist who commits an accidental act of vandalism that shakes him, albeit temporarily, out of his sleepwalking existence. Overflowing with humorous, strange, and insightful social observations, the novel is told with Mehlman's particular sensibility. The unnamed podiatrist reveals the details and secrets of his story to a friend in a coma, which places the narrator in that wonderful middle ground between telling and not telling. Despite his friend's comatose state, the narrator chooses, on a few occasions, to withhold information because he thinks it's too personal. "It's a slight cheat on my part," Mehlman said, "because it allows the narrator to be conversational." Still, it does create an intimate bond between reader and narrator. In a refreshing twist, Mehlman created a narrator who still loves and respects his wife, Alyse. Even after 24 years, he's still trying to impress her. "You never hear a story about a marriage that works," he said, "that a guy is happy to be in." And Alyse has a cool edge to her. She's more perceptive, maybe smarter than her husband, but less grounded. Meaning she's a fully developed character, not some trophy wife. "It's so easy to have them at war with each other, to have that quiet hatred," Mehlman said, before adding, "But who's going to do that better than Updike, anyway?" There's a wonderful moment in the novel where the narrator is at a stoplight and his wife is asleep in the seat next to him. He looks at her and sees a little drool on her cheek and he feels good about the drool. While the narrator may spend much of his life sleepwalking through it, he is fully engaged in his relationship with Alyse, and you can't help but like him for that. I wondered why Mehlman would turn to writing a novel, given all his success with TV writing. "I just like the actual work," he said. "You want the actual work to be something you love because the second you send it out it's devalued by like 50 percent. It's like driving a new car of the lot, it looses its value immediately." On the challenges and strategies of writing funny, Mehlman said, "I think it helps to have a certain awareness of wanting to be funny. One great things about Seinfeld was that I became very aware of the seemingly meaningless little thoughts that float through my head. And they're funny. And they end up being universal." He went on the say that the word joke hardly ever came up at Seinfeld and that funny was organic to the show. "There are very few totally original thoughts," Mehlman continued. "If your New Year's resolution was to have one original thought, it would be difficult. Most thoughts have been thought before. It's just a matter of who can capture them and put them into words. It's a race." The novel didn't have a title the whole time Mehlman was writing it. After he was done, he heard George Harrison singing All Things Must Pass with the line, "It's not always going to be this grey". 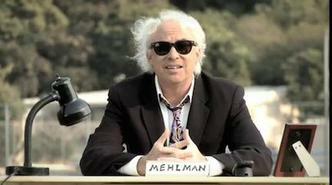 And with his apologies to George Harrison, Mehlman came up with It Won't Always Be This Great. He says the title doesn't exactly pertain to the book, it's more a feeling that captured the whole rather than any of the parts. Some of that feeling can be felt near the end of the novel when the narrator and his family are taking a drive through their neighborhood. There's this sense that inside the car everything is good and that they are all, for a moment, a united front against the craziness. It's clear that this is temporary and that they will all soon leave the safety of the car and rejoin the world of crazies. But for a moment things are that great. When I asked Mehlman about his approach to writing, he said "I don't think you can spend enough time deciding on the exact wording of your sentences. Sentence structure is everything. When Fran Lebowitz's first book came out, what made it so funny was the perfect English." He went on to talk about using grammar and using as few words as possible, and how throwing in an extra word can ruin a line. 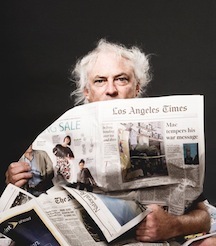 "If I have a sentence that I think is going to be funny, and its starts off in nine words, I start thinking, isn't there any way I can cut it by a third, just to get the line out faster." "I have very little advice about writing, but one of the few I have is that you have to put out a tremendous amount of effort to make it look effortless. That's the most important thing to me. It has to look like you didn't put much effort into a joke because if it shows effort it's a problem. If it shows too much effort it's failed." By that measure, It Won't Always Be This Great doesn't seem to have taken any effort at all. 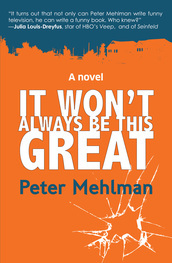 See all of Peter Mehlman's work at http://pmehlman.com .